Return of the Jedi has one goal: closure. Luke (Mark Hamill) must come to terms with his Jedi powers and confront his father. Han (Harrison Ford) and Leia (Carrie Fisher) head into the battle for Endor to knock out a shield so the second Death Star can be taken out, ending the Empire’s reign. It does all of that, plus bridge the gap between Empire grand finished and Jedi’s opening in Jabba’s palace. It’s crowded, hence why some of those George Lucas changes are reviled. Overloaded with character as it is, Lucas saw fit to slip in a grossly overdone musical number, offensive to those who enjoy music and Star Wars fans in general. That’s still here. Ewoks blink too, probably a less grievous error in judgment than some fans would make it out to be; it doesn’t change anything. Jedi remains the Ewok show, the furballs caught in a battle of mechanical firepower and ancient defenses. That creates a fun parallel, the series so focused on its array of futuristic laser blasters and “that’s no moon,” planet-destroying battle stations, watching the Ewoks smash some Imperial Walkers with logs is a break from the norm. Defending Ewoks isn’t as difficult as some would make it out to be. Not so for the blatant “No!” uttered by Vader during Jedi’s crucial finale, another bit of Lucas tampering fans would have survived without. Vader is now as whiny as Anakin, something the original trilogy was wise to avoid. He thinks before doing, the moment in which he saves his son not just a reaction anymore. It’s a shift in regards to who the character is, and that’s inexcusable. Jedi is left alone beyond those slip-ups in non-creative genius. Long standing additions have aged unsuccessfully, Boba Fett’s already unceremonious dismissal from the movie franchise made all the more painful by the dated computer generated Sarlacc monster. Space battles have remained almost entirely untouched, and it’s not difficult to see why. Glamorous models, tracking techniques, and seamless integration into the Endor backdrop make Jedi’s finale as intense as any of the others. That said, the Emperor and crew sort of deserve what’s coming them. Recreating the battle station with a hole big enough for the Millennium Falcon to drive through? That’s impossibly poor planning. Jedi would find a theatrical home in 1983, technological advances in all aspects allowing this trilogy-ender to stand out on Blu-ray. This is the cleanest and purest of the original three in hi-def, detail rousing to the HDTV devotee and intensely focused. Qualms with prior films in this set are forgotten minutes into Jedi, a mild grain structure barely visible with no degradation to the source. Close-ups are simply dazzling, Richard Marquand’s lens work impeccable and certainly meant for a presentation such as this. More than any other, Jedi has the most opportunity to impress, the Super Star Destroyer model in full view and that little forest moon offering up all it can for this AVC encode to spit out. A solitary shot of the cast peeking over some of the foliage at 57:22 has always been a fuzzy mess, this round of home video releases offering no fix either. The rest of Endor is beautiful, color saturation giving the plant life an intense, bright green that was certainly not present previously. Tree bark and leaves are individualized, not static clumps due to low resolution or dated compression. Visual effects shots will be the sole downgrade, someone either a little overzealous with the clean-up or it’s simply an after-effect of the multi-pass processes. Mid-range faces, for only seconds out of the film, will carry a dreaded and familiar haze of digital manipulation; the surprise of the Endor Imperial shield crew as they’re taken hostage is a rare example of what can go wrong. Thankfully, it’s as uncommon as it sounds, and it’s nearly impossible to pinpoint the problem’s source. Black levels return with their heavy handedness, crushing out those finer details, the Emperor’s throne room cloaked in dim lighting. It weighs on the images, a pseudo metaphor for Luke as he confronts his fears. For Jedi and what the narrative is trying to do, it makes sense, and is even suitable. When they’re not devastatingly rich, they may take on earthy hues, the interior of Yoda’s hut swerving away from black and landing on a deep brown. As Luke watches his father’s body burn, the screen is awash with a reddish orange, still depth-inducing enough, although the difference is blatant as the camera pans up to a celebratory sky. Jedi is the only one of the three to carry some visible print damage, and much like those scenes that look filtered, it’s barely enough to mention. Were this any other catalog effort, it might even go unnoticed. As Yoda drifts away, the right side of the screen will carry a dim vertical scratch, just enough that is can be picked up during general viewing. With all of the digital trickery and pristine nature of the other original films, it’s a wonder how that slipped by. We’ll start with the one moment of disappointment in Jedi’s DTS-HD 6.1 mix, and that’s the demise of the Super Star Destroyer. Whereas bass is added to everything and anything in all action scenes, that explosion, so massive is scale, is deadened. It’s as if it the Destroyer doesn’t even make impact, the bass push nominal at best. That’s the only thing here worth complaining about, this another brutal, powerful audio restoration focused on intensity and boomy low-end support. 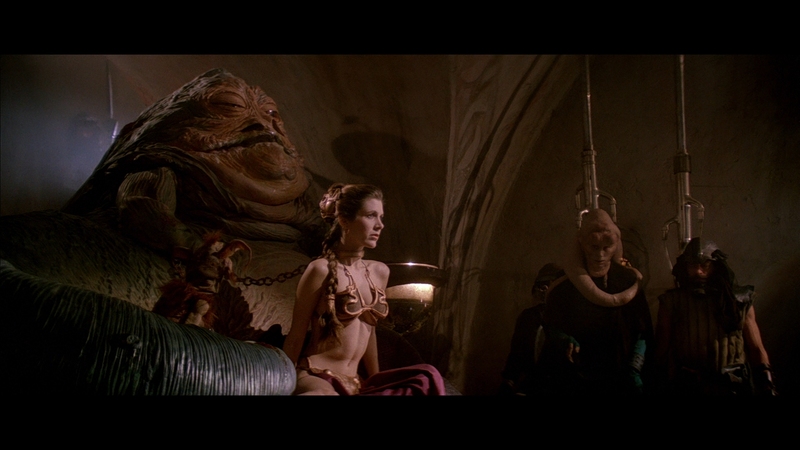 Jabba’s barge is accompanied by a subwoofer rumble that keeps growing in power as the flames continue their rise. Speeder bikes slam into trees with a pop which extends the brutality of their impacts. Empire ships and Rebel fighters will explode in grand style, many not only bursting into flames, but spinning in some way that they’ll be forced to catch either the stereo channels or surrounds. Moving onto those rear channels, Jabba’s palace and its boisterous atmosphere is alive in this mix. Surrounds are elevated without being overdone, but sitting in the mix naturally. Music is subtle, with the exception of that musical atrocity that is Sly Snoodles. Back to the speeder bikes, they have never traveled like this before, tree bark whipping by and the speeders taking over the stereos when the camera situates itself on the sides. First-person riding is a phenom of catalog title mixing. Space battles don’t even need to be discussed in detail simply because they’re perfect. John William’s score, restored here to its absolute cleanest quality possible, is very much a part of this mix. Even under assault from whaling Tie Fighters and laser blasts, not to mention explosions or dialogue, it’s a presence. These audio mixes can carry this franchise over into whatever format they appear on next, unless of course Lucas adds more Snoodles. George Lucas, Carrie Fisher, Ben Burtt, and Dennis Muren dish out their third commentary for this set. Another archival interview constructed commentary comes from the thoughts of 27 different cast and crew members as they recall their experiences. The rest of Jedi’s extras are on a separate disc in the box set, ready to be reviewed at a later date in the interest of being as thorough as possible. The score reflects the film’s disc only.